Sudetenland Medal with Prague Bar: Bronze plated tombac, 32 mm, Austrian court mounted ribbon, near mint condition. 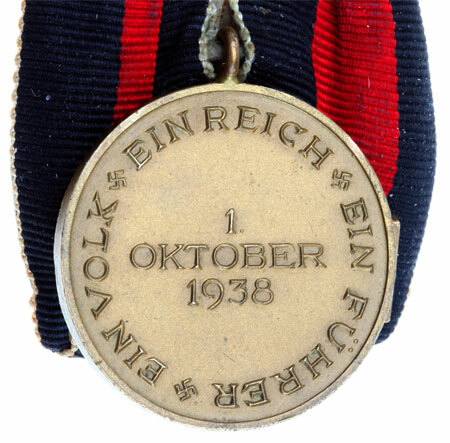 Instituted on October 18, 1938, the medal commemorated the union of the Sudetenland to Germany. Once again Hitler employed skillful diplomacy, using brinkmanship as a tool to bring the Sudetenland under German control and paving the road for the annexation of Czechoslovakia. The medal was awarded to all German and Sudeten State officials and members of the German Wehrmacht and SS who marched into Sudetenland. 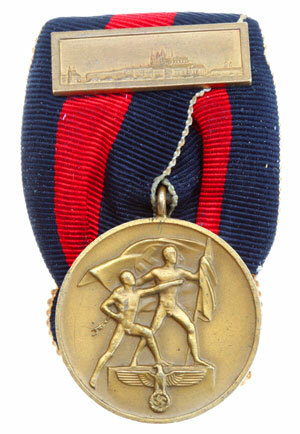 A total of 1,162,617 medals were awarded. 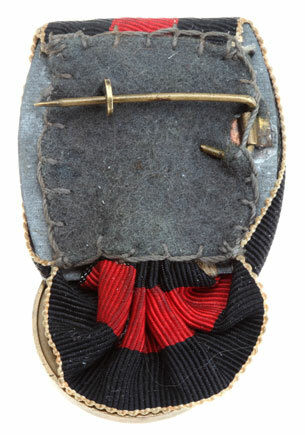 The Prague Bar: awarded to all military personnel participating in the occupation of the remnants of Czechoslovakia on March 15, 1939. It was awarded until December 1, 1939. In all, 134,563 bars were awarded. Bronze plated tombac, 32 mm, initials HC (Hanish-Conée) in the left side bushes, exceptionally strong detailed strike, very light wear.